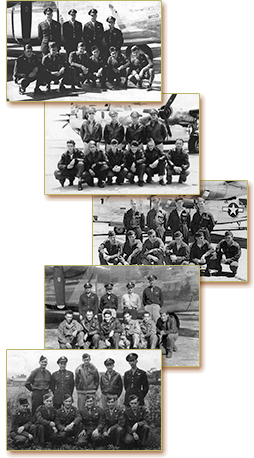 There were 70 original crews and 49 replacement crews that flew at least one mission for the 492nd, not to mention promoted pilots and such. That adds up to a very large list of men. We're presenting these crew listings here in two ways to make it as easy as possible for you to find the men you might be seeking. Each listing method paints a different picture of the entire 492nd story, but will eventually get you where you want to go to give you what you want to know. Insight into how these crews were formed can be found on the main Training page. Both lists have camera icons to indicate that the page for that crew will have at least one photo within it. A green arrow within either Crew List indicates that significant additions or changes have recently been made to a particular Crew Page.